When the Mississippi River Finally Wins. Let's Start Planning. 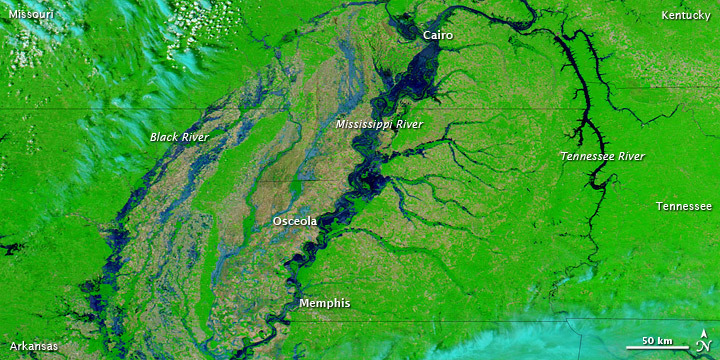 The Mississippi River flooding of 2011 is one of the greatest flood events in the river's history. High water mark records were set in many places along the river, and the US Corps of Engineers has used every trick in its book to reduce the impact on cities. Millions of acres of land have been inundated and economic losses are enormous throughout the basin. One story that was not as widely disseminated, but needs to be understood is the story about how the Mississippi River reroutes itself every 1000 years or so and is trying to do so again. This article by Thomas Lewis discusses the scenario in great detail. Essentially the issue is this: The US Corps of Engineers has "tamed" the river and caged it in. The river actually wants to reroute itself into the Atchafalaya River basin, which would then take a shorter, more western route to the Gulf of Mexico through Morgan City, LA. Right now the Atchafalaya riverbed is about 18 feet lower than the Mississippi's. Eighteen feet! Without the current control structures, the river would have already (and eventually will) shift into the Atchafalaya. This change of route will be devastating to our economy. The Port of New Orleans will become a backwater; most of the industries along the lower part of the river will go out of business; shipping will be disrupted for years; Morgan City itself will be devastated and much of the river basin north of it will be destroyed, because the infrastructure (bridges, etc.) were not built to accommodate the entire Mississippi River. The river is going to win. We beat it in 2011, but someday the river will win. It might be next year; it might be in ten years; we might fight it off for another fifty. But it's going to win this battle, and it will be a catastrophe. So we know it's going to win. We know. Wouldn't it be smart to manage the change than just keep whistling in the dark until it finally happens? What if we were to plan now to deliberately reroute the river in some future year, say 2050? That gives us forty years to plan and get ready. Because of the way the river is currently managed, we can even transition the shift over a period of time--diverting more and more of the flow into the Atchafalaya in advance of the full change. Build new and rebuild existing infrastructure along the Atchafalaya River so that it will accommodate the new Mississippi. Work with the industries along the way to transition their operations from their current locations to new locations. Plan for use of the freed up land in the current river basin: parks, farms, etc. Building up Morgan City and other cities along the new route to take advantage of their new asset. Creating a more modern management system for the river that maintains a more natural ebb and flow, allows for regular flooding and helps to maintain the delta rather than destroying it. Planning for rehabilitating the current "dead zone" in the Gulf of Mexico at the current Mississippi River Delta. This could be a boon for fishing. If we consider this rerouting of the river as an opportunity rather than a problem, and by giving ourselves forty years to implement, we might even come out the other side better off. For instance, as the industries along the current Mississippi relocate, their existing facilities and land can be cleaned up and repurposed in better ways. The new plants built along the new route can be designed at the cutting edge of sustainability. The end result could be a huge improvement over the status quo. But if we wait for the river to win, then our response will be crisis driven. Decisions will be made that will be regretted later. Opportunities will be missed. The entire event will be an enormous economic, social and humanitarian disaster. Which one will it be? What would be the effect upstream if the Mississippi jumped into the Atchafalaya? Elementary observation of water suggests that upstream shipping would be devastated, too, and a lot of riverfront property in St. Louis, Kansas City, Memphis, would be suddenly mudflat-front property, and the river would be able to accommodate smaller amounts of shipping. Or am I underestimating how big the river is upstream? Thanks for whatever information you can give. It's for a SF novel. This is not my area of expertise, but offhand I would expect that anything upstream of the first lock north of the diversion would be unaffected. Another Mississippi River concern with wetlands restoration. The levee will be undermined at peak meander points and send a tidal wave south. My solution will prevent this and also remove the dead zone. Please see below link. It would be better to turn MrGo into a canal to reach NOLA. Plus at least one other breakthrough. Then to have the Third Delta refill Barataria Bay with more swamp. Then to sacrifice the Birdfoot. Then to have downstream traffic stir up the mud to help create the downstream land.